A member of the American Expeditionary Force during the First World War, Charles Edward Jackson was the son of Irish immigrants and a native of Northampton, Massachusetts. Drafted into the 76th (Liberty Bell) Division and assigned to the 301st Ammunition Train of the 151st Field Artillery Brigade, he served in France for a full year beginning in June 1918, seeing front line duty only in the last few days of the war. After the Armistice, he was reassigned to a classification camp in central France where he helped process American soldiers heading home. After making his back in June 1919, he worked as a clerk in a hardware store in Northampton until his death in 1930. Written entirely while in the military service, Charles Jackson's letters describe his exploits during the First World War. An optimist, strong Catholic, and good soldier, Jackson describes his year overseas, from mustering at Camp Devens through life in an ammunition train and the long post-war months spent on duty in a classification camp in central France. Although nearly devoid of actual battle content due to the role his unit played and the reach of censorship, Jackson's letters are descriptive and entertaining, describing day to day life, the late offensives of the war, the influenza epidemic and Armistice, and his growing sense of impatience while awaiting demobilization. A member of the American Expeditionary Force during the First World War, Charles E. Jackson was a working class Irish Catholic man from Northampton, Mass. Jackson's parents, Patrick and Catherine (Whalen) Jackson, arrived as immigrants from Waterford, Ireland, in about 1860 and after marrying in 1863, steadily assembled a large family. Although far from wealthy, Patrick's hard work brought his success enough to purchase a home and small farm at 174 Hinckley Street in the Bay State Village neighborhood, a largely Irish community that served as the focal point for the family for many years. As his children came of age, each took their place in the trades, with daughters listed in the census as dressmakers or milliners and sons as carpenters and brick masons. The youngest of twelve (although three had died before his birth on April 17, 1889), Charles was employed as a clerk at the large Main Street store operated by J. A. Sullivan when he registered for Selective Service in June 1917. When his number came up early in 1918, he was ordered to Camp Devens and assigned for duty with the 301st Ammunition Train of the 151st Field Artillery Brigade, a part of the 76th (Liberty Bell) Division. By the time his unit left Camp Devens in July, the war dictated a notable change in role. When they shipped out, the 301st left behind the horses they had trained with, learning that they were to be reequipped and motorized in France. For the most active part of his service, Jackson drove trucks. The 301st were not sent forward until October, when they operated near Saint Mihiel, the German salient which had been cut off less than a month previously, and they took part in action directly only in the last week of the war. After the Armistice in November, and with no more need for ammunition trains, the 301st was reassigned to the 164th Infantry and sent for duty in the classification camp at Saint Aignan des Noyers. For a long seven months, Jackson and his comrades helped evaluate American soldiers for priority in returning to the states. 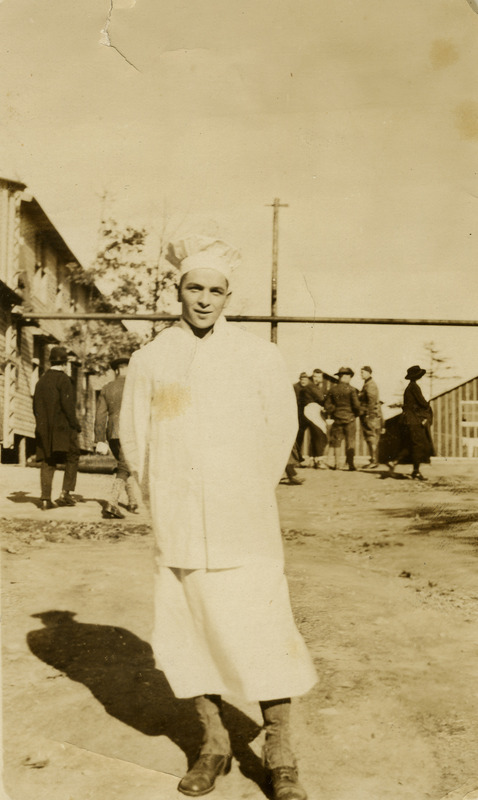 An optimistic soldier, Jackson was satisfied with the posting at first, seeing it as a way to help the wounded or gassed get home, but he gradually grew frustrated with the slow pace and then angry at soldiers who used political or other connections to jump ahead. He remained in Saint Aignan des Noyers until early June, when a bout of appendicitis earned him his ticket. Jackson's elderly father died before he had a chance to return to Northampton. Civilian life for Jackson meant a return to familiar work. Resuming his job at J.A. Sullivan, he took possession of the family home at 174 Hinckley where he lived with his elderly mother and various brothers and sisters until his death on April 12, 1930. He is buried with his parents, a grandmother, and three brothers at Saint Mary's Cemetery in Northampton. Written entirely while in the military service, Charles Jackson's letters describe his exploits in the American Expeditionary Force during the First World War. An optimist, a strong Catholic, and a good soldier, Jackson describes over a year of life in an ammunition train from mustering at Camp Devens through the long post-war months spent on duty in a classification camp in central France. Although nearly devoid of actual battle content due to the role his unit played and the reach of censorship, Jackson's letters are descriptive and entertaining, describing day to day life, the late offensives of the war, the influenza epidemic and Armistice, and his growing sense of impatience while awaiting demobilization. The letters are addressed primarily to "sister" and "bro": sister (called Min in some letters) is probably either Margaret or Mary; bro appears to be his next oldest brother Thomas. Among the highlights of the collection are an original poem on the role of the ammunition train in the AEF and a superb letter from Cornelius Lucey, a neighbor from Hinckley Street and fellow first generation Irishman, who describes action during the Aisne-Marne offensive (probably Belleau Wood). Gift of Ed and Libby Klekowski, Nov. 2011. Richard M. Russell, The 151st Field Brigade. Boston: Cornhill Co., 1919. This collection has been digitized and is available for viewing online in SCUA's digital repository, Credo. Digitization of this collection was made possible by a generous gift of Lloyd J. Bonfield. Cite as: Charles E. Jackson Papers (MS 721). Special Collections and University Archives, University of Massachusetts Amherst Libraries.